Enjoy a hassle-free arrival in Kona with this private transfer service from Kona International Airport (KOA). Meet your driver at the Big Island's airport, and relax on the journey to your hotel or private residence in Waikoloa, Keauhou, Kona or Hualalai. Opt for a stretch limousine, a Mercedes-Benz SUV or a Merdeces-Benz sedan, depending on your preferences and group size. Price is per person, based on 8 adults per car/vehicle. Please note: You MUST select a hotel that coincides with the area in the itinerary section of this product. Evite o estresse de encontrar um táxi ou compartilhar um serviço de transporte no Aeroporto Internacional de Kona (KOA). Basta digitar seus dados quando fizer sua reserva, pagar antecipadamente e depois mostrar seu voucher para o seu motorista quando você pousar na Ilha Grande. 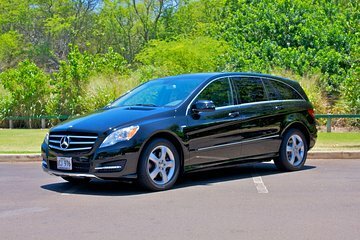 Viaje em uma limusine, um Mercedes-Benz SUV ou um sedan Merdeces-Benz, dependendo da sua preferência e tamanho do grupo. Sente-se e aproveite o passeio sem se preocupar com taxímetros ou se perder. Este serviço de transporte Kona está disponível para hotéis ou residências particulares em Waikoloa, Keauhou, Kona ou Hualalai. O preço é por pessoa, com base em 8 passageiros por veículo. Por favor note: Você DEVE selecionar um hotel que coincida com a área na seção de itinerário deste produto. deserved 5 stars. clean car, nice driver, everywhere in time. Great job. Excellent ride to the hotel! Young lady driver was right at the baggage pick-up holding a sign with our name on it. Retrieved our baggage, while we waited in a stretch limo drinking ice cold water/juice and eating local candies. The driver was great! Told a little about what to expect the up-coming week weather, what to do, etc., took our pictures both inside and outside the car. Usually I wouldn't spend the money on a stretch limo for a 20 minute drive, but sure surprised and impressed my wife and her best friend!